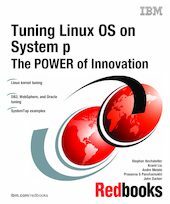 This IBM Redbooks publication describes what you can do to improve and maximize the performance of your business server applications running on System p hardware with the Linux operating system. It describes how to improve the performance of the System p hardware, the operating system, and specific server applications. Part 1 explains the technology implemented in the major subsystems in System p servers and shows what settings can be selected or adjusted to obtain the best performance. Part 2 describes the performance aspects of the operating systems: Red Hat Enterprise Linux, SUSE LINUX Enterprise Server, and IBM Virtual I/O Server. Part 3 introduces the performance monitoring tools that are available to users of System p servers. Part 4 shows you how to analyze your system to find performance bottlenecks and what to do to eliminate them. Part 5 examines specific performance characteristics of specific server applications. This book is targeted at people who configure POWER processor based servers running Linux and seek to maximize performance. Some knowledge of servers is required. Skills in performance tuning are not assumed.